This was my first year participating in the Santa Sack Swap. I was assigned Danette of Quilting Chemist. Danette has outdone herself with all the gifts she sent me. I LOVE them all. Her work is amazing. The beautiful flower went up on my wall in my sewing area. 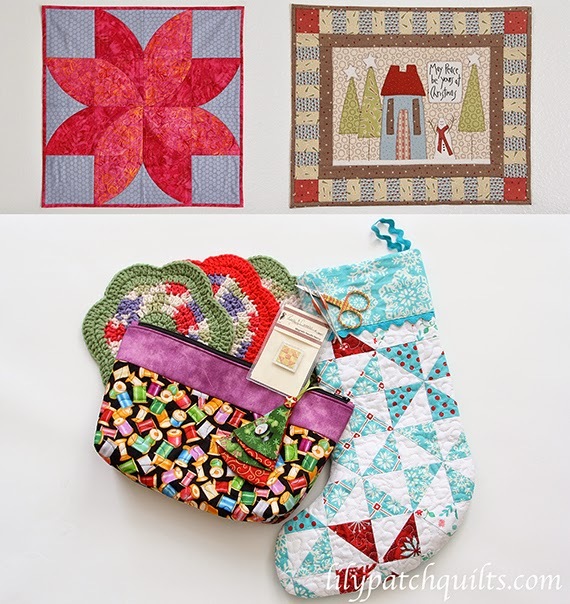 The Christmas mini quilt went with my Christmas decorations. I love my new stocking. The zippered pouch is such a nice size to hold my knick knacks and now I will probably put embroidery supplies in it for traveling. She also made me the crochet coasters peeking out from underneath the pouch. I feel so spoiled. Thank you Cheryll for hosting the swap! I had so much fun. P.S. There were gifts wrapped in fabric, not in the picture. I've swapped with Dannette in other groups and she does lovely work. What wonderful pressies you received. I just love the color of the Christmas Stocking. You received some super nice gifts, Kim. I love a successful swap. Such a sweet gift bundle you received! WoW... beautiful gifts in that lot! What lovely gifts! How cute is that little tree!! Kim, I'm glad you enjoyed the swap. I loved what you sent me, can't wait to get the quilt hung up and try the patterns and fabric sent. Thank you and. Happy Holidays!